When watching Rectify, I’m often reminded of that old Sesame Street song, “One of These Things Is Not Like the Other,” as there is truly nothing else like it on television. Released from Death Row after 20 years when DNA evidence overturned his murder conviction, Daniel Holden (Aden Young) has warily readjusted to life on the outside with his family—and this season, prepared to leave his hometown for good. There’s no series quieter or more contemplative, and so willing to let you marinate in its world. One of the best things about “peak TV” is that it allows an outlier show like Rectify to exist. Lucky us. This year, Comedy Central boasted one of the strongest lineups in its network's history—including a resurgent South Park, Broad City, Inside Amy Schumer and the final season of Key & Peele—but its funniest, most incisive series generated only a fraction of the attention given to those other shows. Review's TV host Forrest MacNeil (Andy Daly) “reviews” life experiences submitted by viewers. The show got darker in Season 2 (one experience: killing a person), but that made the journey even more rewarding. As Forrest might say: "Review Season 2, five stars." If You’re the Worst’s sophomore season had simply stuck to the brilliant game plan from Season 1—looking at the lives of two horrible people (Chris Geere's Jimmy Shive-Overly and Aya Cash's Gretchen Cutler) who have coupled up and somehow bring out the best in each other—that would have been satisfying enough. But instead, the series took an unexpected, yet completely organic detour as Gretchen coped with clinical depression, while never losing its caustic sense of humor along the way. While You're the Worst contains some of the sharpest, funniest writing you'll find anywhere, the season finale's last moment offered TV's best nonverbal scene all year. There was no TV moment more stunning this year than the final seconds of this HBO docuseries in which Robert Durst, unaware that his mic was still on, seemed to finally confess to murdering three people. But even without that jawdropper, Andrew Jarecki’s look at one of our country's most fascinating, frightening men was riveting, revealing and unnerving—everything a great documentary should be. Yes, questions of exactly how long Jarecki sat on some of The Jinx's most damning evidence before sharing it with police continues to be troublesome, but the show still haunts me nine months later. Last year’s best new series upped its game for Season 2. Transgender woman Maura (Jeffrey Tambor)—who spent the first season embracing her new life—continued her journey while her three children (Gaby Hoffman, Amy Landecker and Jay Duplass) also went in search of themselves. Creator Jill Soloway has only begun to mine the depths of a family in transition, in many more ways than just the show's title. Meanwhile Tambor—who collected a slew of awards this year for his astounding turn as Maura—should start clearing out more shelf space for his likely trophy haul in 2016. Call this one the comeback of the year. Season 1 of this drama, about the aftermath of a tragic event in which 2 percent of the world’s population "departed" without a trace, was all over the map (and that’s putting it kindly), but at its best, it was one of TV’s finest shows. This year was a powerful course-correction for creators Damon Lindelof and Tom Perrotta, who returned with a show that was endlessly surprising and challenging. You never knew what you were going to get as each episode began, only that it would be better than you could have ever imagined. I'm cheating here, but this was the only way to get a few more deserving shows into Adweek's top 10. Some of the best television shows of the past decade came to an end this year—Mad Men, Parks and Recreation, Justified—and thrillingly saved their (almost) best for last. Justified roared to the finish line with its strongest year since Season 2, while Mad Men and Parks (the only broadcast series on my list) also wrapped things up splendidly. On the late-night front, both Stewart and Letterman bowed out with poignant, perfect farewell episodes. They should be added to the all-too-rare club of shows that didn't overstay their welcome or stumble to a finish, but left their audiences wanting much, much more. My pick for the best series of 2014 might have been even better in Season 4 as married, undercover Russian spies Philip (Matthew Rhys) and Elizabeth (Keri Russell) finally revealed their true identifies to their teenage daughter, Paige (Holly Taylor). Its ninth episode, "Do Mail Robots Dream of Electric Sheep?" (featuring a bravura guest turn from Lois Smith) was the best hour of television you'll see all year. The Americans is going to be one of those shows, like The Wire, that people discover for years and years and wonder why nobody told them about it sooner. Consider yourself told. After the debacle that was True Detective Season 2, I was a little worried about the second installment of last year’s other magnificent miniseries, Fargo. Silly me: From the first episode to last night’s superb grace note of a finale, Noah Hawley managed to surpass Season 1, crafting a 10-episode masterpiece that never ceased to surprise, enthrall and delight. (The cast is overstuffed with fantastic performances, from Jean Smart’s crime family matriarch to Kirsten Dunst’s in-over-her-head hairdresser, and a special shout out to Patrick Wilson’s understated Lou Solverson, who held the whole thing together.) I miss it already. These 10 shows just missed the cut, but this marvelous lineup would represent quite a formidable top 10 list of its own. If you aren’t watching these shows regularly, correct that immediately: Better Call Saul (AMC), Black-ish (ABC), Bojack Horseman (Netflix), Catastrophe (Amazon), Hannibal (NBC), Last Week Tonight With John Oliver (HBO), The Mindy Project (Fox/Hulu), Scandal (ABC), South Park (Comedy Central) and Veep (HBO). 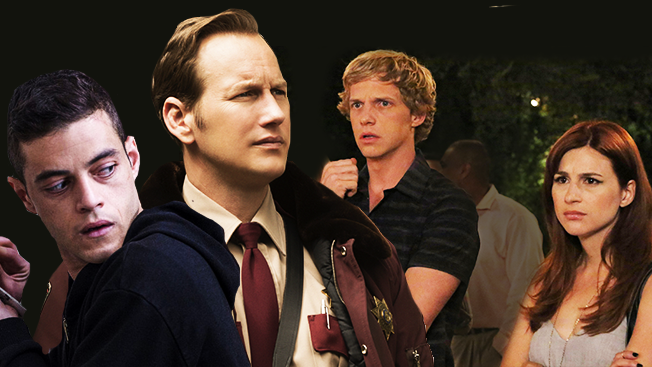 And check back tomorrow for the 10 Best New TV Shows of 2015.